Locked Out: Was SickBrick Stolen From Its Creator? After years of friendship and collaboration, Mladen Bosnjak awoke one morning to find that his partner had locked him out of profits and sales stats for his own game. Mladen Bosnjak was on top of the world in December 2016. An artist and student from Croatia, he was studying abroad in Portugal for a semester, a great opportunity that would go toward his graduate studies in multimedia. To top it all off, he made his living creating games, more a way of life than a career for the 24-year-old indie developer. Bosnjak’s only claim to fame so far was SickBrick, a futuristic first-person shooter boasting bright colors and speedy gameplay reminiscent of classics such as Quake. He had begun development nearly six years earlier. In a single afternoon, six years of hard work and a tight bond with his business partner were rendered moot. "Just as I got used to living in a new environment and starting to have the time of my life, I went to check SickBrick's revenue on Steamworks,” Bosnjak told me. “It was then that I found out I'd been locked out of it and had no control over my game on Steam." A gamer since childhood, Bosnjak began developing games at age eight when his family purchased a PC. When he was 16, he got his feet wet in NeoAxis, an engine that included premade modules for common game systems such as physics and enemy logic. Off-the-rack programming routines suited Bosnjak. Although he enjoyed programming, he leaned more toward creating art. As he painted 3D models for weapons, enemies, and level geometry, NeoAxis sped things along by enabling him to plug in code he needed to tie everything together. At the time they met in 2011, McDowell was working on a game called Incognito, an amalgam of FPS, RPG, and RTS mechanics. When players boarded a vehicle, the game unfolded from a first-person view. Exiting vehicles and moving on-foot switched the camera to an overhead perspective and added strategy and role-playing elements into the mix. I felt betrayed and enraged seeing the biggest achievement of my life being stolen from me. Early on, Bosnjak and McDowell seemed a match made in development heaven. McDowell, a programmer, handled wrote code while Bosnjak brought visuals up to snuff. He sharpened graphics displayed during both on-foot and in-tank segments of Incognito’s first episode, which had already been released for sale, and built models for buildings, units, tanks, and other objects from scratch. Bosnjak’s creations were retroactively added to Incognito’s first episode. Future releases incorporated them out of the gate. McDowell had launched the game on Desura, a digital distribution platform for Windows PCs that catered to smaller releases made by independent devs. Bosnjak received no monetary compensation for his efforts on Incognito. In exchange for working pro bono, Bosnjak pitched McDowell on another arrangement. "From the public stats on the Desura page of Incognito, I saw the traffic was very low and doubted McDowell made any substantial money from it that he could pay me with,” he explained. “Since I already knew he was a competent programmer, I asked him to work on SickBrick." Bosnjak didn’t give a second thought to working on Incognito for free. McDowell’s work would more than make up for the amount of time and energy he, Bosnjak, had spent helping his friend on Incognito. And they were friends, at least as far as Bosnjak was concerned. They talked on MSN—now Live Messenger—almost daily, chatting about game development, the projects they were working on, and about more personal subjects. Only one incident gave him pause. Unknown to him, McDowell had appropriated some of Bosnjak’s art assets for use in Space Trucker, a science fiction-themed FPS that McDowell developed in tandem with SickBrick, which McDowell helped to program. "I sent him a mail warning him about it while Space Trucker was still in beta,” Bosnjak recalled, “but he said he was using my assets only temporarily. I believed it was not worth the trouble arguing with him to remove my assets, and although that did not sit well with me, I let it go since he was still sending me my part of the revenue for SickBrick." By the time McDowell agreed to help Bosnjak take SickBrick across the finish line, the game had entered its final sprint. 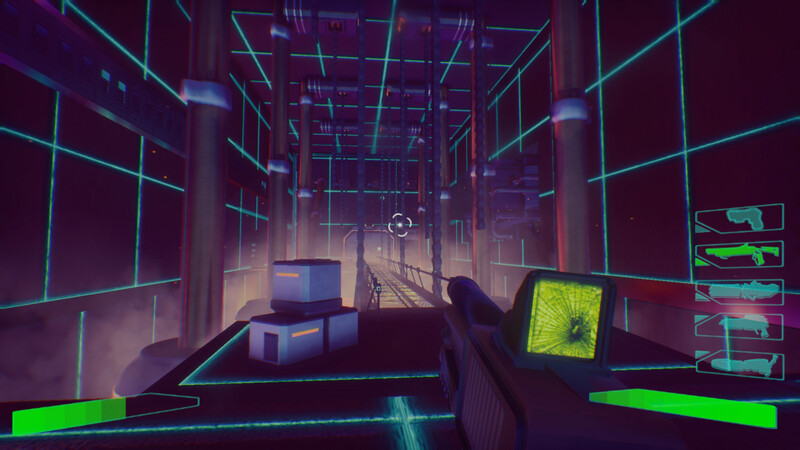 Thanks to NeoAxis’ readymade modules, McDowell was able to dive into code and help polish off final tasks such as developing a HUD (heads-up display) and tightening behavior for enemies while Bosnjak focused on his own to-do list: textures, character and weapon models, animations, levels, and a soundtrack. In addition to programming, McDowell brought another perk to the table. He had purchased a license for NeoAxis, saving Bosnjak a lofty expense. McDowell’s contributions were significant enough that he broached the subject of sharing revenue. In 2011, McDowell and his business partner, Kyle Polulak, with whom he had founded his company Magrathean Technologies, drafted a formal agreement for Bosnjak to sign. 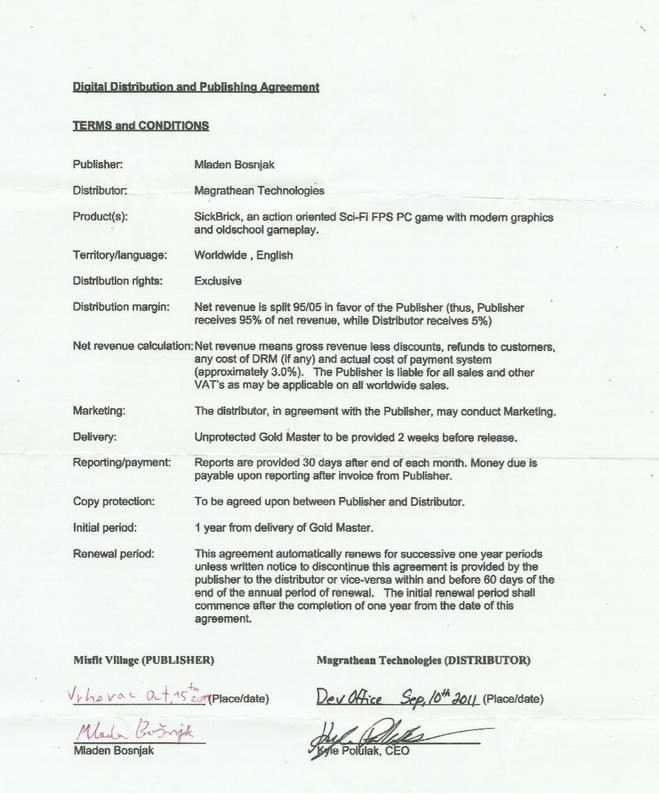 Per the contract’s terms, Bosnjak, listed as SickBrick’s publisher, would earn 95 percent of net revenue from Desura and other platforms where the game would be sold. Bosnjak judged the terms reasonable and signed the paperwork. In early 2015, both Bosnjak and McDowell were eyeing greener pastures. Desura was floundering; it would later change hands a number of times until, later that summer, present owner Bad Juju Games filed for bankruptcy, leaving the platform in limbo. Bosnjak and Magrathean Technologies migrated SickBrick and other games to Steam Greenlight, an initiative where users check out a selection of games and vote on which ones Valve should bring to its monolithic digital service. Recognizing that their games stood a better chance of selling more on Steam, Bosnjak and McDowell revisited the terms of their agreement. "McDowell did finish everything I asked of him and later when we updated the game for Steam, he integrated Steamworks and updated the game on a newer build of the engine, fixing bugs and optimizing features in the process,” Bosnjak explained. Bosnjak proposed a 60-40 cut in his favor. After all, SickBrick had been near completion before McDowell joined in. Then he reconsidered. McDowell had been a good friend and business partner so far. SickBrick had sold poorly on Desura, rendering Magrathean’s five percent share virtually worthless. Yet McDowell had not complained. For those reasons, Bosnjak widened McDowell’s revenue stream by a much greater amount—an even 50 percent of net profits. They sealed the deal by way of a virtual handshake. "For the Steam release of the game, we did not sign anything, but rather agreed on terms through email and Skype chats,” Bosnjak admitted. While McDowell polished SickBrick, Bosnjak created more animations and worked on the game’s storefront page, where potential customers would be able to see screenshots, watch a trailer, write reviews, and read an overview of SickBrick’s features. Eventually, talks turned to which party should be the point of contact with Valve. Bosnjak and McDowell reached the mutual decision that McDowell, located in Canada, would take charge of the business end. Bosnjak made it clear that he did not feel pressured to turn over the reins to his partner. "We definitely both reached that conclusion. I talked to several indie devs from Croatia and it is quite complicated to get a game on Steam. I would have had to open a company to be able to sell the game and would have had to pay double taxes since Croatia and the USA do not have a double taxation agreement, whereas Canada and the USA have one. That's why we both agreed it would be best for him to sign the papers with Valve." SickBrick went live on Steam in February of 2015. When Bosnjak’s first paycheck arrived, he found himself $1100 richer. For Bosnjak, a student in Croatia, that was more than enough to cover rent, food, and college expenditures like books for months. Still, Bosnjak didn’t let his friend’s duplicity bother him. Money from SickBrick was coming in steadily. Then sales slowed as interest in SickBrick waned. McDowell suggested a revision to their contract. Each time sales reached $1000, McDowell would send Bosnjak a check for his half. Bosnjak agreed to the change. Like McDowell, he was privy to the sales reports developers had access to within Steamworks, a control panel from which they could follow activity on their game. Until one day in November 2016, when Bosnjak tried to log into his Steamworks account and found his access denied. He contacted McDowell via email. According to Bosnjak’s transcript of the conversation, he was more befuddled than suspicious, believing some sort of glitch or snafu had caused him to lose access. McDowell responded that same day. He had removed Bosnjak from the account because Bosnjak no longer worked with the NeoAxis engine and, by extension, all the games McDowell was publishing through Steam. Since Bosnjak no longer needed access to the control panel, McDowell had removed him. Bosnjak grew upset, waiting over two weeks to write back. He replied saying he would not touch any of McDowell’s projects; he only wanted to track SickBrick’s revenue and be able to generate download keys for reviewers interested in trying the game, as was his right. 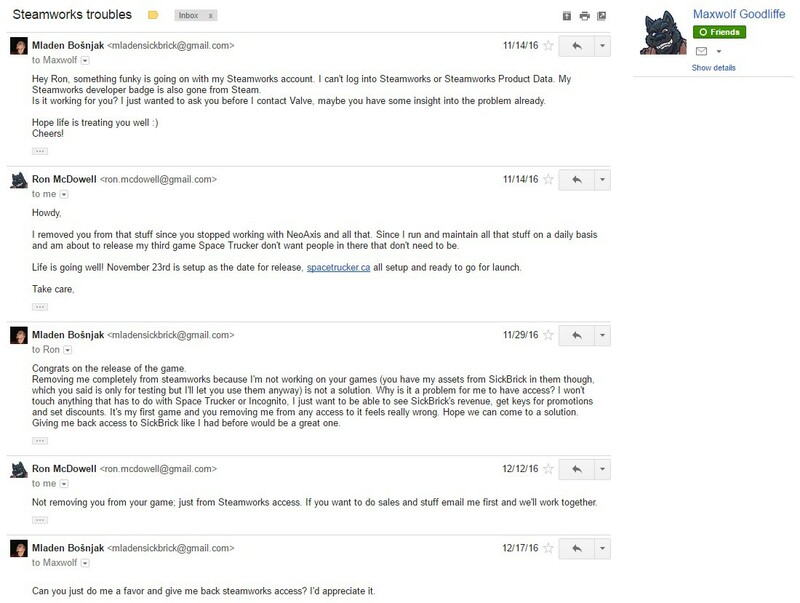 McDowell’s reply came another two weeks later, explaining that he had not removed Bosnjak from SickBrick, just Steamworks, and that Bosnjak should contact him if he wanted to arrange a promotion for the game. Five days later, Bosnjak asked McDowell to restore his access. That was December 29, 2016. According to Bosnjak, McDowell has yet to respond. In effect, his onetime friend had locked him out of his own game. Words like friendship and trust mean nothing when there's business and money involved. I learned this the hard way. Bosnjak needed time for what McDowell had done to sink in. He sent two more emails but received no reply. 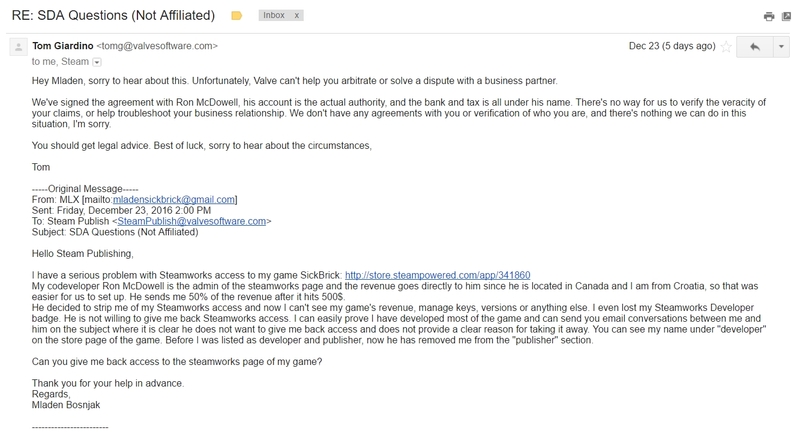 One by one, McDowell was closing the lines of communication with Bosnjak, removing him from his Steam friends list, ignoring instant messages, scrubbing him from the “Developer” credit on SickBrick’s Steam store listing, and even publishing the game on another Microsoft storefront, from which he would receive all revenue. "I felt betrayed and enraged seeing the biggest achievement of my life being stolen from me,” Bosnjak said. “I thought of what to do for a long time. I couldn't even bring myself to tell my family and friends what happened for quite some time." With contact with McDowell having gone cold, Bosnjak reached out to Valve for help resolving the issue. He explained the situation and offered to send proof that he was SickBrick’s original developer. Valve sympathized with his situation, but was unable to help. The document Bosnjak and McDowell had signed listed bank and tax information under McDowell’s name. Legally, he was SickBrick’s owner. Seeking advice from other developers, Bosnjak filed a DMCA claim. 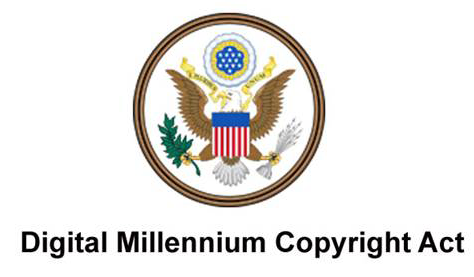 The Digital Millennium Copyright Act enables copyright holders to take action against those who attempt to steal or block access to their original works. Along with his claim, Bosnjak included over one gigabyte of assets he had created for the game, many of which McDowell could not possibly have access to. Valve responded by taking SickBrick down from Steam, only to reinstate it based on the content of a counterclaim filed by McDowell. According to copyright law in Croatia and several other countries including the United States and Canada, a work belongs to the person or persons who created it. While Bosnjak could have filed a copyright formally, he technically did not need to. Furthermore, any distribution of a copyrighted work without the creator’s consent is considered exploitation. Unfortunately, Bosnjak’s lack of a paper trail showing definitive proof of ownership seems to be responsible for his predicament. All paperwork on file with Valve points to McDowell as the person responsible for SickBrick. "We have an established process for handling copyright infringement reports on Steam,” Valve’s Doug Lombardi, the company’s vice president of marketing, told me when I reached out to the company for comment. That process involves following procedure outlined in the DMCA, which states that any party who consciously misrepresents their ownership of materials could be held liable for damages. McDowell has signed paperwork in his corner. Bosnjak does not. “The thing Valve isn’t equipped to do is judge internal disputes within a Steam publisher itself,” Lombardi concluded. As of this writing, Bosnjak said that neither Valve nor Microsoft has replied. Bosnjak has exhausted his options. Seeking legal advice, he ruled out hiring a lawyer and taking McDowell to court. "I live in Croatia, a country with a legal system so complicated and slow that I would probably lose money even if I won the case against McDowell,” he said. “Additionally, I'm still a student and have limited funds. Also, I would rather focus my time and energy into my next project than spend it on court hearings." I would rather focus my time and energy into my next project than spend it on court hearings. All Bosnjak wants now is a way to have his work removed from digital stores so McDowell can no longer profit from it. Whether or not that happens, he’s ready to move on. "As many people of the internet told me, I was quite stupid and gullible from the start and through this whole ordeal, not seeing the red flags that popped up. Words like friendship and trust mean nothing when there's business and money involved. I learned this the hard way." After Bosnjak went public with his story earlier this month, McDowell and Kyle Polulak took evasive action, porting SickBrick to the Unity engine—ironic, given that McDowell had cited Bosnjak moving away from NeoAxis as the initial reason for locking him out of SickBrick—and billed it as a director’s cut. The repackaging still contains assets that Bosnjak created, and credits the game as being “inspired by” his efforts. Nevertheless, Bosnjak is doing his best to put the SickBrick ordeal behind him. He’s writing his graduate thesis on multimedia, has founded Misfit, an indie studio that produces virtual and augmented reality software, and is creating a VR game on his own time. He shared his side of the story in the hopes that what happened to him will serve as a warning to other novice developers who may find themselves in a similar position. "I hope they learn from my mistakes and cover all their bases when dealing with any type of business,” he said. “If you worked on something for as long as I did on SickBrick, you should make contracts before entering a partnership with anyone, even if you don't see your work generating much revenue. That said, even contracts won't help you protect your work, but you will be able to take legal action more easily if everything is clearly outlined in contracts and a possible scammer will think twice about crossing you if he knows you have your bases covered." David Craddock posted a new article, Locked Out: Was SickBrick Stolen From Its Creator? Another great feature. Sad story, but he sounds like he has a great attitude. really unfortunate for the poor guy, but you really can't take people at their word when it comes to business. Yeah. At least he learned from his mistake and kept his positive attitude. That's messed up. McDowell doesn't seem like a very nice person. Good article, David. Enjoyed it. He seems amazingly calm now. It's hard to let stuff like this go! Yeah I had read something about that. Dude's got a better attitude about it than *I* would, that's for sure. Crazy stuff I feel for the guy :( , cool article David, thanks for the write up.